Having declared democracy in danger at a famous press conference in January, the newly sworn-in chief justice's stint of 1 year and 44 days will be keenly watched for what he does to defend this ideal, notes M J Antony. The misgivings of the legal profession and the cynics over the past eight months of turmoil in the country's highest court came to nothing. 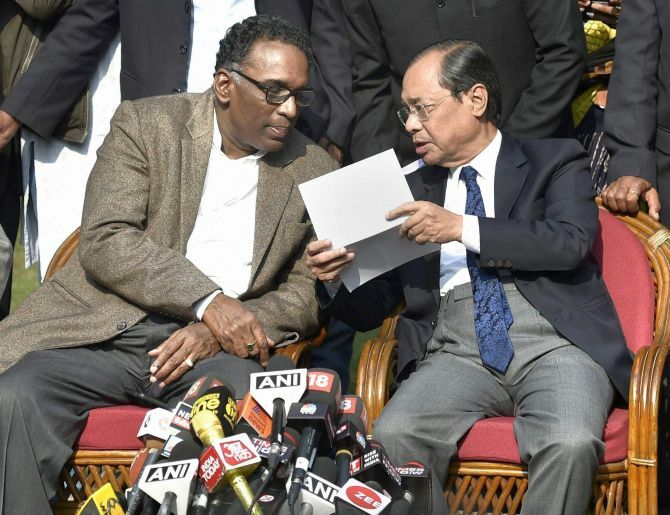 Despite all the angst following his famous 'rebel' press conference with three other judges in January this year, Justice Ranjan Gogoi was not sidelined. Instead, Chief Justice Dipak Misra, against whom the protest presser was organised, stuck to convention by elevating the senior-most judge of the Supreme Court to the nation's highest judicial pedestal. This decision, which the government is traditionally bound to accept, exorcised the ghost of two past instances when convention was flouted to wreak vengeance on the judiciary for passing inconvenient judgments -- or in Justice Gogoi's case, highlighting inconvenient facts. He joined the three rebels to allege that sensitive cases were being assigned to benches of the chief justice's choice without any apparent criterion. He has not explained in detail how democracy is in danger. So his deeds in the coming months would be the only clue to back up the allegation. He is the administrative head of the nation's judiciary, and it cries out for reforms. The Supreme Court wrote last month that the subordinate courts are on a 'ventilator' and are starved for funds for even basic necessities. It was a Gogoi bench that banned ads with politicians' photos except those of the President, the prime minister and the CJI. The judge generally writes short judgments devoid of frills. He ruled that under the Hindu Women's Right to Property Act, upon the death of a Hindu man, his widow became entitled to a share in the joint family property. He recently laid down norms for raising ordinary lawyers to 'senior advocate' level, an issue that had divided the bar. He has also delivered significant judgments on trademarks, income tax and sick industries. In a case involving mega star Amitabh Bachchan and his income from the Kaun Banega Crorepati shows, his bench quashed a Bombay high court order that rejected the revenue authorities' power to re-assess income. The judge has a political background -- his father was once chief minister of Assam. However, it is recorded in a recent book that Keshab Chandra Gogoi did not want his son to be a chief minister, but the chief justice of the country. Justice Gogoi's simple habits seem to have travelled with him. He was reportedly seen buying fish from a Delhi market. Born in 1954, he started practice in the Gauhati high court after graduating from St Stephen's College, Delhi, and the law faculty there. He was elevated as a judge in the high court in 2001. He later became the chief justice of the Punjab and Haryana high court. Since Justice Gogoi is a man of few words and rarely seen in public platforms, what he did say recently offers some clue to his mind: 'Independent journalists and sometimes noisy judges are democracy's first line of defence'. In the same Delhi speech, he batted for a more pro-active judiciary.